Yusuf Abdul Charkha is a lawyer for the 57 accused in the Godhra case, including Haji Bilal and Mohammad Hussain Kalota. The trial is slated to begin in the court of Additional Sessions Judge, Godhra, B S Parikh a few months down the line. In a taped, exclusive conversation, the Godhra-based advocate gives Senior Editor Sheela Bhatt the defence version of the Godhra investigation story. How many of the accused in the Godhra case do you represent? A total of 57 people have been accused, all of them are my clients. Except three, all of them belong to Godhra. The three others are from Ujjain, Nagada, and Chennai. The investigations into the Godhra incident of February 27 failed to find the real culprits. In order to satisfy public outrage, the police shifted many who were arrested for violations of curfew on and after February 27 into this case. Kamal Badshah is one such person. He is from Chennai, a cook on a visit to Godhra. Mansur of Ujjain sells bangles, he was here on his regular 'up-down' train journey. Both unknowingly violated the curfew, and now both have been implicated in this case. Who are the prime accused? Most of them have been arrested under Indian Penal Code section 147-148 for rioting after unlawful assembly, under sections 302 and 307 for killing people, and under the Railway Act for damaging public property. They were also charged under the Prevention of Terrorism Act -- but on February 27, when the incident happened, the state had not yet notified the central government act. This was done on February 28. They applied POTA prima facie. But then the violence that followed was even more heinous. It would have become necessary to apply POTA to the culprits in those cases as well. But they were Hindus and applying POTA to them would have put the government in trouble. So the government withdrew POTA even in the Godhra case. Could you provide a profile of the accused and of the case against them? The police has made up a case against four known municipal councillors of the city -- Bilal Haji, M H Kalota, Salim Sheikh and A R Dhincha. They have been seen in the mob by few of the witnesses. And that is all the evidence there is against them. They are accused of being part of a mob, not the actual doers. The police claim that outside S6 compartment of the Sabarmati Express, around 1,500 people were present. There is, however, no evidence in the charge sheet, no mention of the details of those who actually torched the train. What is the defence case? After filing a first information report, the Railway CID carried out an investigation in parallel with the railway police, headed by Deputy Superintendent of Police K C Bawa. Crime Branch chief Rakesh Asthana joined the investigation later, and he was the one who staged the re-enactment of the Godhra scene. He stopped the train, as was done on February 27, noted the timings of the two instances of chain-pulling. The charge sheet says the accused formed an illegal gang, torched the train, and burnt people to death. The police initially said the train was burnt from outside, but the forensics laboratory, through actual demonstrations, proved that the train had been burnt from the inside. It was demonstrated that some material under seat number 72 was responsible for the blaze. So the situation is that Bawa's probe is based on the theory that the compartments were burnt from outside, and Asthana's investigation shows that it was burnt from the inside. Is that what the defence is based on? The police investigation is very weak. Had the investigation been fair and thorough, the case itself would have been different. It is evident on the face of it that witnesses have been manufactured. They have fixed on one man in a crowd, there are no reliable witnesses. There is no direct evidence to show that this particular man torched the compartment, that he killed these people. The chargesheet is silent on these counts. (Note: The police is slated to file a supplementary chargesheet shortly, based on the testimony of new witness Ajay). Is Ajay's statement under section 164 likely to be important? It is important, but in this regard I'll make a point -- Public Prosecutor Panchal asked the court, when responding to a bail petition by the accused, to ignore Ajay's statement. He argued that Ajay had gone to court directly to give his information. The PP, arguing on behalf of the railway police, told the court, "We do not rely upon the statement, it's not part of our investigation." The statement is recorded under section 167 of the Criminal Procedure Code. Ajay went directly to the judge with his eyewitness statement, and his statement suggests that Godhra was not a communal incident, but a fight between a section of passengers and the vendors at the station. The most important aspect of this is to note that as per Ajay's statement, the 54 who have been arrested were not part of the torching of the compartment. He has given a new set of names, of tea vendors in Godhra station, who actually torched the train. None of the 54 accused named in the chargesheet have been named by Ajay. But some of the names that figure in the chargesheet were also named by Ajay, and they are now absconding, is that right? Yes, that's true. But the evidentiary value of Ajay's statement will be known only when the police produce the witnesses. The technicality will also come into question -- why did Ajay stay silent for so many months? If he claims he was in shock and under risk, why is he talking now? The fact is that it's a drama staged by the investigation officers. The forensic laboratory report turned the official theory upside down. The investigative officers had not studied the report before putting up the chargesheet. When the report became an issue, they created a fresh witness to nullify the mistakes in the chargesheet, namely their claim that the train was burnt from outside. Ajay's statement will not stand in court because it's a delayed statement. Are you saying that Ajay should be an accused, not a witness? At this stage, the prosecution is itself not relying on Ajay's statement. In any crime, if there are two versions of the police case, then it obviously benefits the accused. As a citizen of Godhra, how do you feel about the case? It is the duty of the state government to hold a fair investigation. I feel sorry that thanks to a sloppy investigation, the real culprits have not been brought to book. While the culprits escaped, criminals were dragged in -- almost as if the police decided, when this happened, that this was a good opportunity to wreck a few political careers. The fact is that no police was present at the nearest station, and the crime was committed in a span of 15 minutes. No one was therefore arrested from the crime scene, namely the Godhra railway station. After the event, curfew was imposed, but many were unaware of that and violated the curfew. At 6 pm on February 27, 41 people were arrested for violation of curfew, and now they have been shown as accused in the case -- that is a fact. A R Dhanita, who supplied water to the fire brigade, has been named as an accused. In the early days, there was much corruption -- people, both Hindus and Muslims, were threatened that if they did not pay, their names would be included in the chargesheet. No police officer asked the people there for statements, it is not true that the area was closed to the police. Do you agree with the basic charge that Razak Kurkur masterminded the incident? He is not that kind of person, he is not the mastermind. First they said Bilal is the mastermind, now they say something else. Kurkur owns Aman Guest House, a soft drinks stall, and a paan shop. I pass by there every day, I have never known him to be involved in any trouble. He was involved in some incident in the 1980s, otherwise he has been clear. Godhra is the result of skirmishes between karsevaks and tea vendors. Kurkur used to supply soft drinks, tea, and such stuff to the vendors on credit -- so the police now say that since this was done by the vendors, it must have been at Kurkur's behest. But then Kurkur was supplying stuff to Ajay as well, I wonder why Ajay is not an accused. 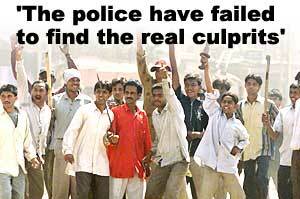 The police investigation is hopeless -- in Limadia Chowki, for instance, 11 bodies have been found though 70 have died. The others have simply been listed missing. No one is investigating, no one cares. Chief Minister Narendra Modi alleges that some Godhra accused have been getting five star food and other material support. Where is this coming from? The accused are in a high-security jail, under government management. If they are getting food and other things from outside, what is the government doing? How can something go in without the consent of the government? It is being claimed that large amounts of money from the Gulf have been coming in for the defence of the accused. Absolutely wrong! Most of them are poor, and we are not charging them anything. Why don't you go see their homes, see how they live? Razak Kurkur and Salim Paanwala are hiding in Godhra. Shouldn't the people there hand them over to the police? Let me ask you a counter question. In Limadia Chowki, for instance, 70 people were burnt alive in a tempo. Why have the people in that region not handed over the culprits to the police? Which society has ever handed over people accused of crime? We are the ones being harassed because we are the stepchildren of this government.